Thatch won his ship from the devil with the devil’s own double-headed coin, and aboard it he wreaked more havoc than any pirate before or since. His love of black powder and obsession with setting the world aflame combined to sink hundreds of ships, sack dozens of ports, and prematurely erupt at least two volcanoes. Thatch’s ship had so many ghosts, they haunted in shifts. 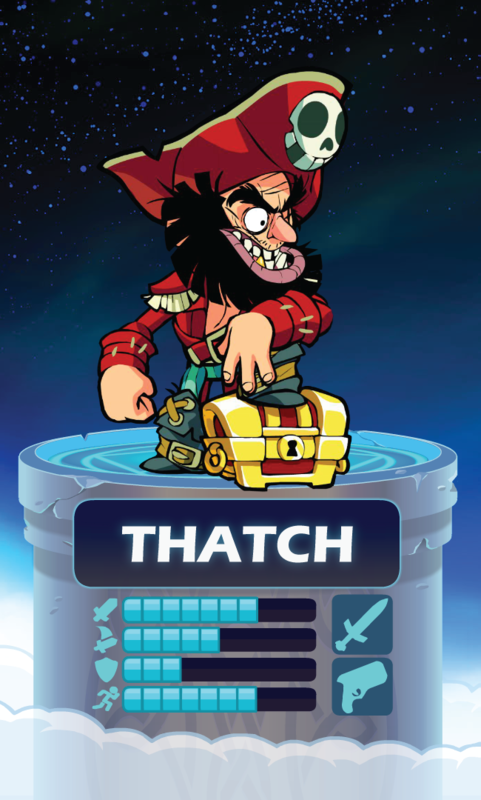 He plays his favorite drinking game, “Drink every time Thatch has a beard.” He claims to be married to the sea, and has a marriage license to prove it. He has a face only a mother could love if he hadn’t made her walk the plank. For Thatch, the Tournament is a paradise of chaos and fire, but even that doesn’t slake his thirst for mayhem. He aids in Vraxx’s schemes to conquer Valhalla out of sheer bloody-mindedness, and when bored will lay deadly traps he calls ‘pranks’ for his fellow Legends. He sneaks out at night to dig holes, knowing the gods must have buried treasure somewhere.